Marci feels possessed by what she perceives as shadowy spectres that take control of her body and make her do crazy things. While spying on the clandestine group known as IgNiTe, she’s confronted by the leader, James McCray. His presence stirs the specters inside her brain into a maddening frenzy. Her symptoms and ability to control them don’t go unnoticed by James, who soon recruits her and shows her the awful truth. Disclaimer: I received a copy of this book in exchange of an honest review. No payments made between me and the publisher. First of all, thank you to the author for giving me the chance to review her book. The first time I saw this one, all I could think was "I want to read this book!!!" and that was the reason why I agreed to review the book. Aside from that, I was curious and the book cover is stunning! Reading the first few chapters of Ignite the Shadows is confusing. I kept asking myself "what shadows?! ", "is this another horror type book?" but as I continue reading, I understood fully what the book was all about and I was amazed how the author did the twists and turns of the story. One more thing I love here was I could relate to the main character Marci -- that's because she's into IT, she's a programmer and I was one too! -- she's adorable in her own way but at the same time annoying because of her in denial attitude. "Smile when you don't want to cry"
The book isn't just sci-fi it also contains a budding romance between Marci and her best friend Xave. But like I've mentioned, Marci's in denial so the real question is, will they have a real relationship? I myself is hopeful! They look good together. What more I love about this book were the secrets behind each character. For example, James, he knew he's something? Who knew that Marci and James have something in common? Also the other people. The people in this book was like living somewhere were you don't know who the real person is. The ending of the book... UGGHHH!!! another revelation that makes me want to read the next book! Is it available already??? please say yes... that ending was something! I knew there's something about Marci's brother, but it still gave me goosebumps! I can't wait for the book two!!! 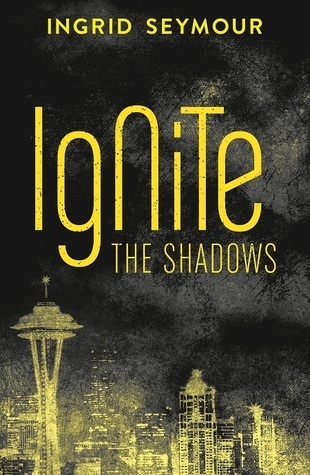 Before I wrapped up... Ignite The Shadows, is a wonderful book! I was delighted and fell in love with the characters in this book. I want this book in my hands, a physical copy of it! Wish I could find one sooner. Such a great read! "Lies are not a good foundation for any type of relationship"
Ingrid Seymour is the author of IGNITE THE SHADOWS (Harper Voyager). When she’s not writing books, she spends her time working as a software engineer, cooking exotic recipes, hanging out with her family and working out. She writes young adult and new adult fiction in a variety of genres, including Sci-Fi, urban fantasy, romance, paranormal and horror.